Morne Steyn is in the national team due to his incredible kicking. However, take his kicking ability away and he is merely a Louis Koen imposter! Morne needs to rediscover the form that made him the first name on the team list in recent years. The pressure of an Australian and New Zealand tour will not help this, a few weeks in Currie Cup action would. Francois Hougaard is regarded by many as one of the most exciting scrumhalves in world rugby. This being said he is being told to play a quarter of each game on the wing. This is not Sharks rugby where we move players around for fun, this is Springbok rugby, lets put our players in their best positions and stop buggering them around. Also can we please use Francois’ skill at running the ball rather than trying to clone Fourie du Preez? I know he has been selected already, but damn. The boy has been out for four months and has played fifty minutes of rugby. Surely the 10 minutes he might play in the next three weeks is a waste when he would have played nearly 200 minutes of Currie Cup to get fit again. We are rushing an injury prone player into the harshest environment when Pat Lambie and Elton Jantjies are both available. This is still a selection I can’t wrap my head around. I don’t care if you like big players. Your reasons for not selecting Heinrich have been nullified by the amount of penalties your other forwards have been giving away. We are overrun at the breakdown and with Bismark injured we now have no players winning the ball. Against Argentina we were punished. Against Pocock and McCaw I fear for our ability to hold any possession. Heinrich is rated by many as the best fetcher in world rugby. Use him. In our back line we have Frans Steyn, Jean de Villiers, Bryan Habana and Lwazi Mvovo who are all more than capable of breaking the line time and time again. We need to give them that opportunity. World Rugby and the laws thereof have advanced since 2007. Our wings only job should not be to go and chase up and under’s, but rather to run the ball and take on defenders. JP Pietersen was in the form of his life, but the only way he made any breaks against England was running onto the kicks of the English side. Why we are trying to build a game on a forward pack that is trying to gel is tough for me to understand when we have an outstandingly strong back line! Elton Jantjies, Jano Vermaak, Pat Lambie, JJ Engelbrecht are all victims of Heyneke being unwavering in his dedication to some of his favourite players. Why take a player on tour and use him merely as a tackle bag holder. If the player is not good enough to get game time surely he is not good enough to be in the squad. I fear that Meyer does select a few players to go on tour when they would be much better equipped to spend a few weeks playing in the Currie Cup rather. 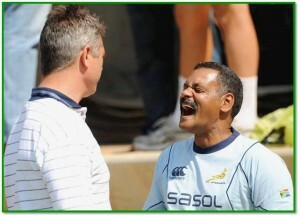 One of the most surprising pictures in SA Rugby is the lack of Rassie Erasmus in the Springbok coaching box. Rassie has been sensational for SA Rugby, transforming the Cheetahs and Stormers into impressive units. This is however where he seems to stop. 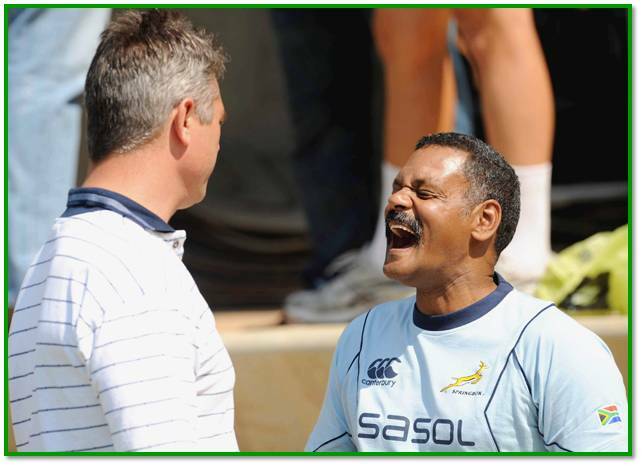 The brand of rugby the Springboks are currently playing is prehistoric and there is an obvious need for evolution by using the coach who can really invigorate Meyer’s Springboks the way Eddie Jones did to Jake White’s Springboks. If you have one of the best in the game, you use them. Sports Illustrated this month showed a very compelling article on all the Springbok players currently plying their trade in the Northern Hemisphere and eye-opening is what it was. We currently are not playing the best rugby as the Springboks and surely the likes of Brent Russell, Peter Grant, Flouw (I know he is in), WP Nel even are better options than some of the current underperforming Bokke. 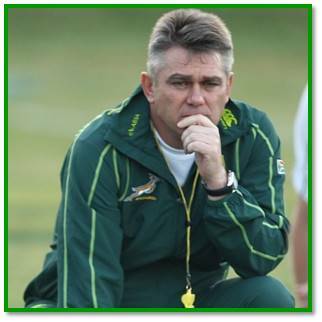 Ultimately we will support the team, but Heyneke, please put the pride and power back into our Bokke!